It had been approximately eight weeks since I last visited the farmers' market, six weeks since I'd had a free weekend, and four weeks since I'd felt any sort of enthusiasm for cooking. Spring was hard. I paid no attention to its offerings, trading my time in the kitchen for taping together moving boxes. A few transitions (the kind most people like to spread out over a longer period of time) occurred simultaneously, and there were moments I thought we would never make it out the other side. But here we are. And it's summer! At the end of June, Andrew and I woke up on our first free Saturday since the beginning of May. We made pancakes, then went to the gym (for my first yoga class in oh, four weeks)...And after that, we stopped by the farmers' market. Just that morning, I was lamenting how uninterested I was in cooking. I usually meal plan every week, heading to the store with a firm strategy in place for the dishes I planned to cook every night, but that morning I couldn't bring myself to flip through a magazine or give it any firm thought. I was completely uninspired, and I hated the feeling. So we walked into the market with no plan whatsoever, and it was exactly what I needed. Without the trappings of my handy list, I let summer's first vegetables tell me what I should make. We went home with a pound of gold tomatoes, ruffled chard, kale, fingerling potatoes, red peppers, a case of strawberries, and pistachios. It only took 20 minutes of standing among the stalls and trusting my instincts to tap into the enthusiasm again. I couldn't wait to start cooking. Andrew had been requesting ice cream steadily for the past month, so pistachio ice cream, or gelato, as it turned out, was the very best thing to make. I was also fresh off of reading a new poetry collection, Take This Spoon by Julia Wendell, so I was itching to make a pairing and find my way back to this space. for my mother, the impatient one. Poem reprinted with permission from the author. Visit Main Street Rag to order your copy. "Holding each soft spoonful in our mouths as long as possible." Isn't that the essence of summer, in a way? Whether it's ice cream or a sunset or a bonfire or a meal under the stars, summer days swing from one to the next and we try not to fall until September. "Savor" invites us in by using a memory many can relate to. Mother and child waft between patience and impatience, and the tasks ahead seem mundane until the moment when "persistence wins," and the ice cream "will thicken and delight, and it will disappear," just like every summer afternoon. That's how it always works, doesn't it? We fight and resist, we let frustrations take over, but once we let go, that's when the magic happens. This poem is a beautiful meditation on relationships, on seasons, and on cooking, the driving force that fuels so many of us. It set me on the right course to embrace the coming days as best I can, and I hope it does the same for you. This recipe is a hybrid of the pistachio butter from 101 Cookbooks, and the pistachio gelato from David Lebovitz. Making gelato (instead of ice cream with an egg-base), really allows the pistachio flavor to shine through. I scooped mine onto a strawberry crumble, but it would also be wonderful drizzled with homemade chocolate shell. 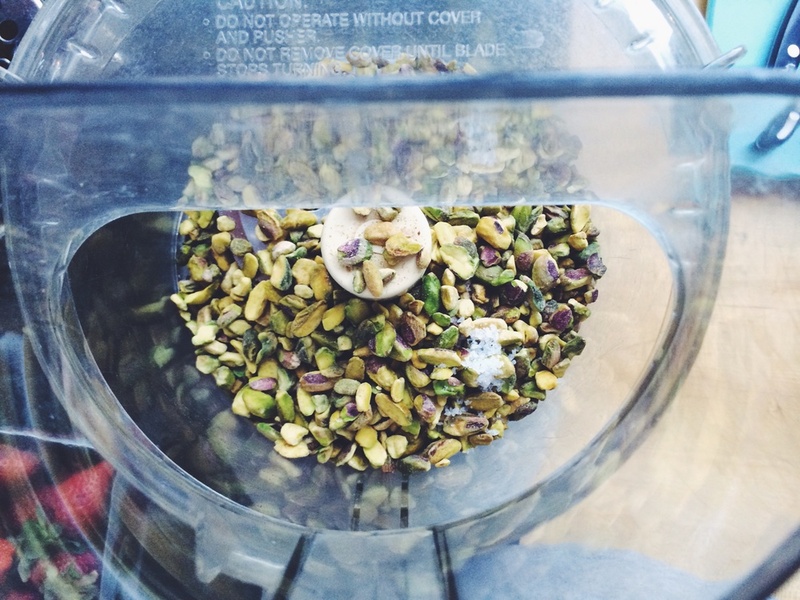 Puree the pistachios in a food processor until broken down. Drizzle in the water until the puree is creamy, then let it run for about three minutes; it will be the consistency of hummus. Rinse out the food processor, then add 1/2 cup milk and the cornstarch, blending until the starch is dissolved and the liquid is smooth, about 1 minute. Heat the rest of the milk in a medium-sized saucepan with the sugar. When it almost starts to boil, stir in the cornstarch mixture and cook at a gentle simmer for about 3 minutes, stirring constantly. Remove from the heat and chill thoroughly, at least 4 hours. Once chilled, whisk in the pistachio paste and a few drops of lemon juice until smooth. If you prefer a really smooth gelato, puree the gelato in a sturdy blender before freezing in your ice cream machine.